One Click Analysis | Fusion Genomics Corp.
FUSIONCloud™ is the final component in FUSION GENOMICS’ ONETest™ platform. 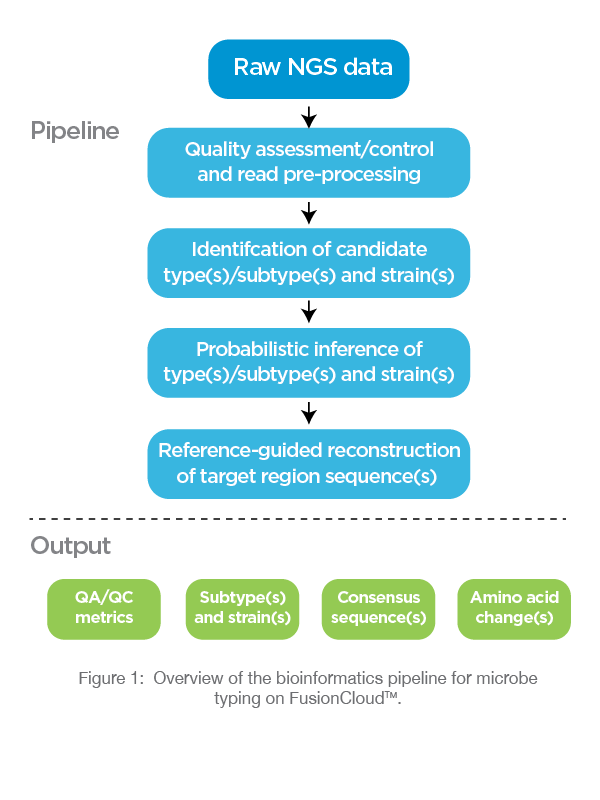 It is a secure and compliant bioinformatics platform for sensitive and multiplexed pathogen identification from (NGS) data generated by the ONETest™ molecular diagnostic assay kit. FUSIONCloud™ analysis software is based on a fully annotated proprietary database developed at FUSION GENOMICS. It contains over 1 million known infectious disease genomes plus some rare pathogen genomes. Its bioinformatics and machine learning tools use pattern matching and statistical rankings which expedites analysis of sequencing data for pathogen identification when compared to simple BLAST based homology. FUSIONCloud™ is able to infer the type, subtype and strain of the pathogen in question. For Research Use Only. Not Intended For Any Human Or Animal Diagnostic Use.